TULSA, Oklahoma -- After two full days of wall-to-wall basketball, the first round of the 2019 NCAA Tournament is officially in the books. Friday provided a little flair the first day was lacking, and you can assign a lot of credit to the top-seeded teams for that. No. 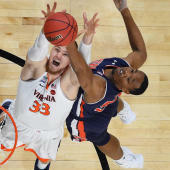 1 seeds Virginia, Duke and North Carolina all had to dig out of early holes to avoid Virginia-like disaster. Each won, but there were some surreal moments when it wasn't improbable to think, at one point during the game, that a 16 seed was capable of beating a 1 -- something only UMBC has ever accomplished. There will be no 16-over-1 this year, but upsets weren't completely ruled out. No. 13 UC Irvine pulled off the largest seed upset of the tournament to date, defeating No. 4 Kansas State. Meanwhile, No. 12 seed Oregon defeated No. 5 seed Wisconsin, No. 12 seed Liberty defeated No. 5 seed Mississippi State, and No. 11 seed Ohio State, in a battle of back-and-forth thrills, defeated No. 6 seed Iowa State. If you're not sensing the tread here, I'll fill you in: The 12-over-5 is officially back, baby. Elsewhere in Friday's madness, No. 2 seed Tennessee escaped cresting Colgate, No. 3 seed Houston made quick work of Georgia State, and Buffalo dispatched of one of only three Pac-12 teams in this year's field. So sit back, grab some snacks, check out the schedule, find your bracket and gear up for the 2019 NCAA Tournament. CBS Sports will be with you the entire way Friday updating this story with the latest scores, highlights and updates from the First Four. If you are unable to view the live updates below, please click here.